henrymillonplus has no other items for sale. 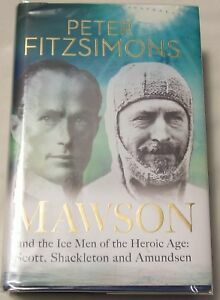 Description Sir Douglas Mawson, born in 1882 and knighted in 1914, remains Australia's greatest Antarctic explorer. On 2 December 1911, his Australasian Antarctic Expedition left Hobart to explore the virgin frozen coastline below Australia, 2000 miles of which had never felt the tread of a human foot. He was on his way to fulfil a national dream he had first conceived three years earlier, while on his first trip to the frozen continent on the Nimrod expedition under the leadership of the charismatic Anglo-Irishman Sir Ernest Shackleton. Author Biography Peter FitzSimons is the author of over 20 books - including Tobruk, Kokoda and biographies of Nancy Wake' Kim Beazley' Nene King' Nick Farr-Jones' Les Darcy, Steve Waugh and John Eales - and was Australia's bestselling non-fiction writer in 2001, 2004 and 2006. Content Note Illustrations, map, ports.